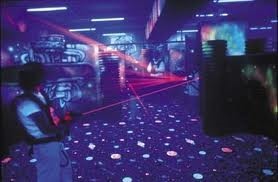 Okay, so i thought laser tag in the dark with a lot of obstacles with a little bit of a twist. Every time you get shot you get shocked, bad. To get the feel of maybe even a taser with that shock. In the taser tag arena there will be many many many other things to get you hurt as well. It is in the dark so there would be marbles on the ground, hidden holes in the floor to fall in one of them which snakes will be in(Bam), things coming out of the wall to hit you in the face, or balls. Mouse traps on the floor, tacks sticking out of the wall, people standing above with buckets of poop. Everyone is bound to get hurt in this stunt. I have been a huge fan of jackass for so long. I am so excited for Jackass 3D.